2 Masters w/Queen, 1 w/2 Twins, 1 w/ Bunk Set. Sheets and Towels Provided. 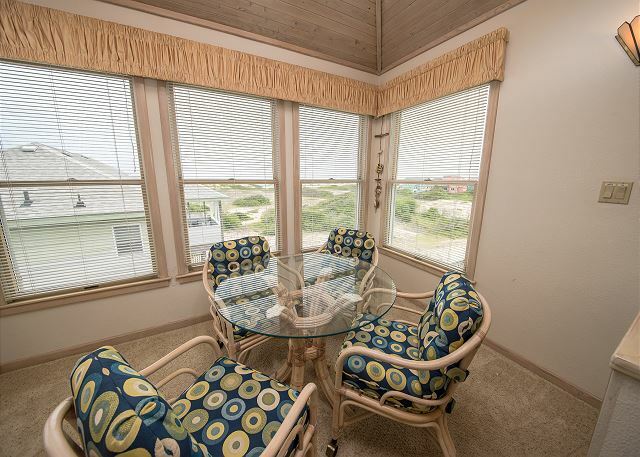 A salty piece of the Outer Banks will be yours to enjoy as you vacation in this beautifully decorated cottage. You can look for dolphins from the ship's watch or take a short stroll to the delightful beaches for a day in the sun. 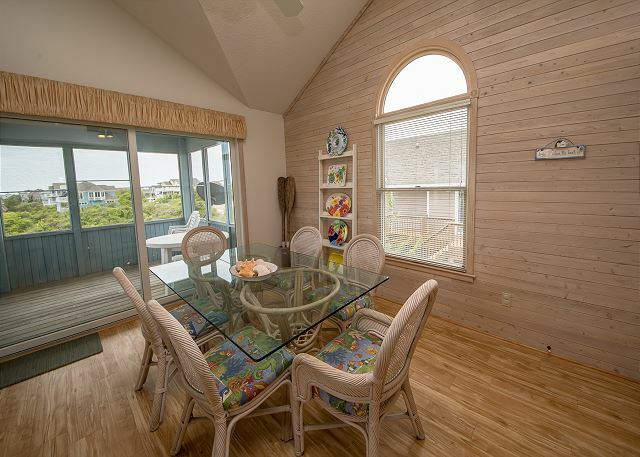 You'll love the spacious, open feeling in the cottage with GREAT panoramic OCEAN views. A Port-A-Crib for the little one, Movies, books, and games. 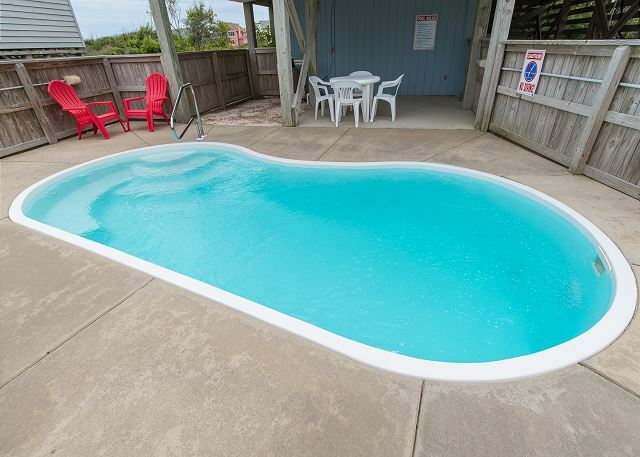 Sun deck, ship's watch, Fireplace (off season) and 13 x 18 Pool. 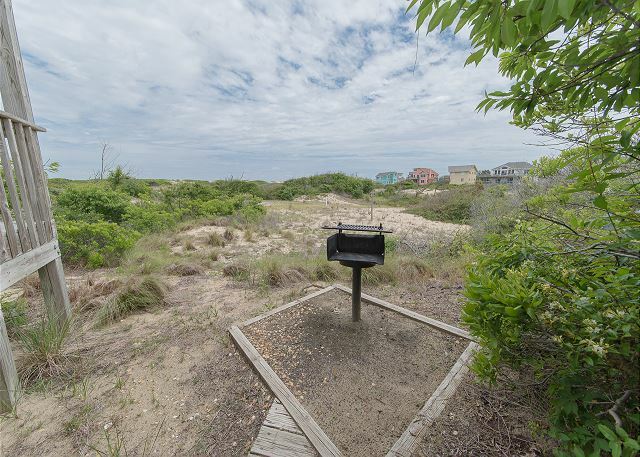 Only 100 yards to the beach access! 3 Flat Screen TVs/3 DVDs, dishwasher, upper deck. New in 2017: New Grill, New Twin Mattresses/Box Springs and New Mattresses on Bunk Beds. 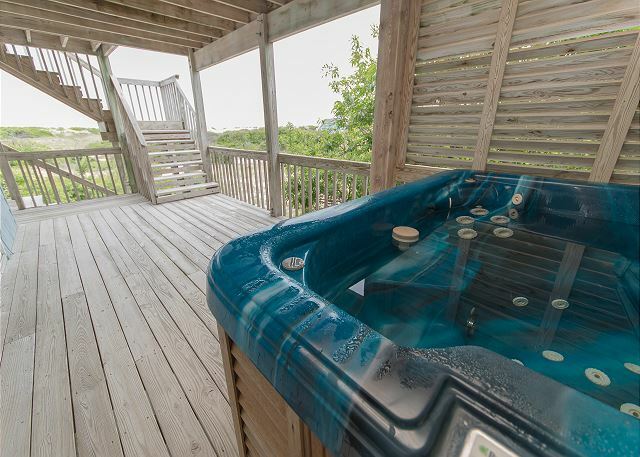 Outside: Hot Tub, Charcoal Grill, Outside Shower. 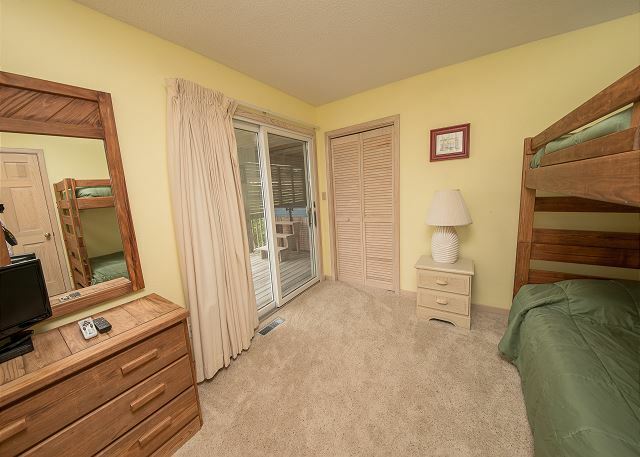 Upper Level: Great Room w/Dining for 8, Screened Porch, Fireplace, TV/VCR/DVD. Ship's Watch w/Seating for 4; looks out to Ocean. 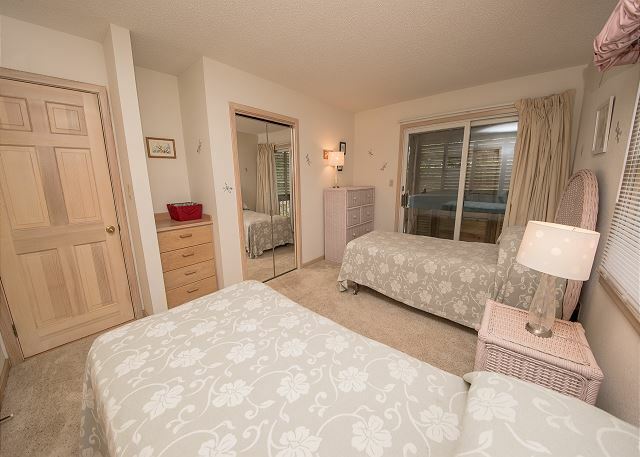 Master Queen Bedroom w/Full Bath. Powder Room. 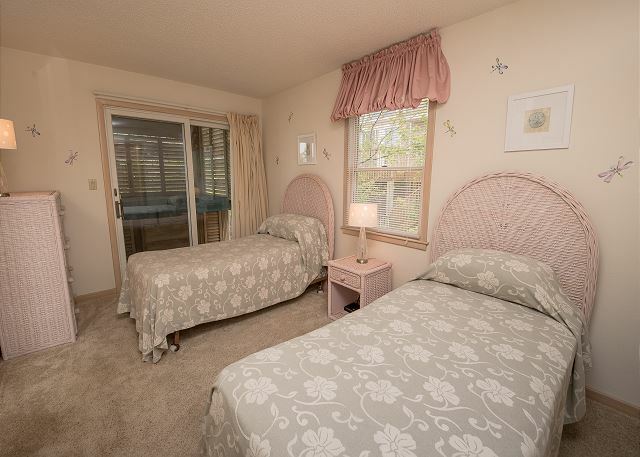 the place is very nice and very close to the beach and the property was very well maintained! Thank you so much for your review! We are so glad you enjoyed your vacation. The owner takes pride in providing their guests the best experience. We really hope to see you again soon! It was a greathouse with everything you need! Short, sweet, and to the point! Thanks for posting, we hope to see you next year! We had a wonderful stay. Close to the beach. The pool was nice for the kids to cool off. There was a grocery store, donut shop and ice cream parlor within an easy walk. Beach was great, not too crowded, and the water was perfect! Thank you for sharing your experience with us! We are so glad you enjoyed your vacation. Very clean, beautiful home with amazing view. No need to walk to the beach for the sunrise when you can watch from the deck. Pool was a huge hit for the kids. 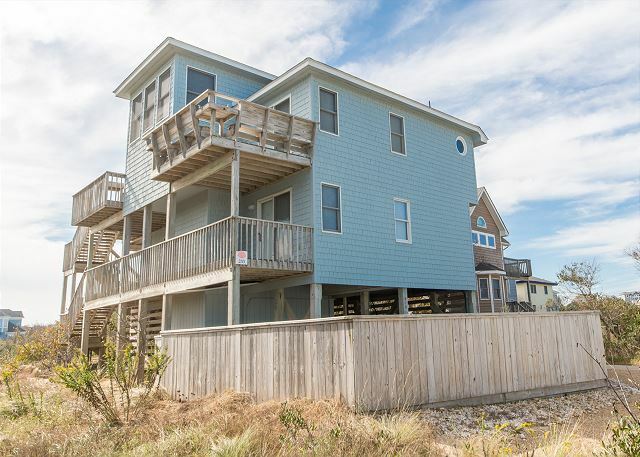 AMAZING location, three houses to the beach and directly across the street from Harris Teeter and Duck Donuts! That made meal prep a breeze! Would recommend to families. 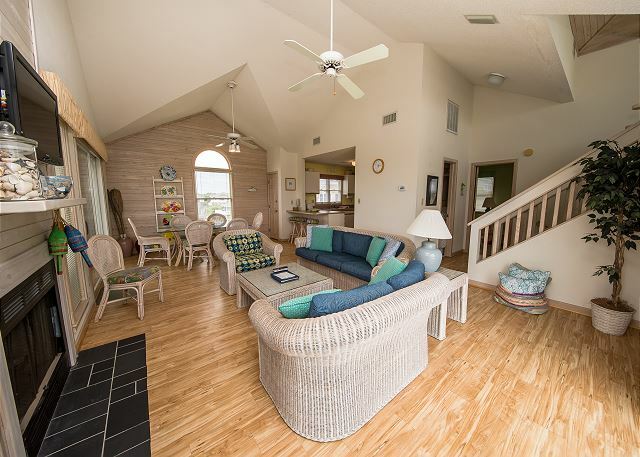 Great house, close to beach access! We had a great time at this house! Our party included 2 families with a total of 5 young children. The house was at the end of a court so it was great for the kids riding their bikes and scooters around the end of the drive way. Also, beach access was really close and easy to get to. The only thing that we think would have been nice would be for the house to have beach umbrellas for guests to use. 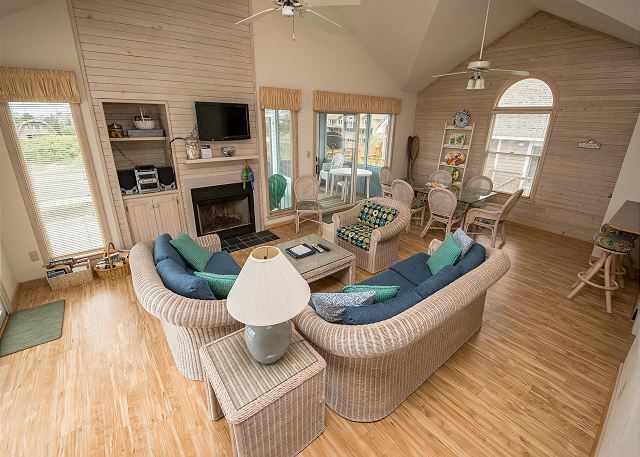 We have rented several OBX vacation homes and this is the first that didn't have beach equipment which takes up a lot of room in the car when traveling with kids/large families. So glad to hear your family had a great time at A Salty Piece of Land, we will pass along your suggestion about the beach umbrellas to the owner. I can agree it is nice to have one less thing to pack! Thanks for posting. Very nice house. Good location. Pleasant people to deal with at the rental office. Thank your leaving us a review. 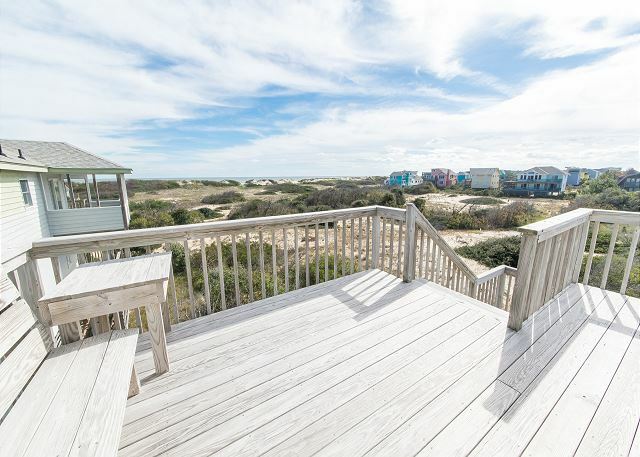 We hope you'll enjoy another great vacation with Kitty Hawk Rentals in the future! Excellent location and fantastic property. The view from the decks were beyond expectations. We were 2 families of 4 and felt we has plenty of space. Easy to check in and out, couldn't ask for a better place to stay! 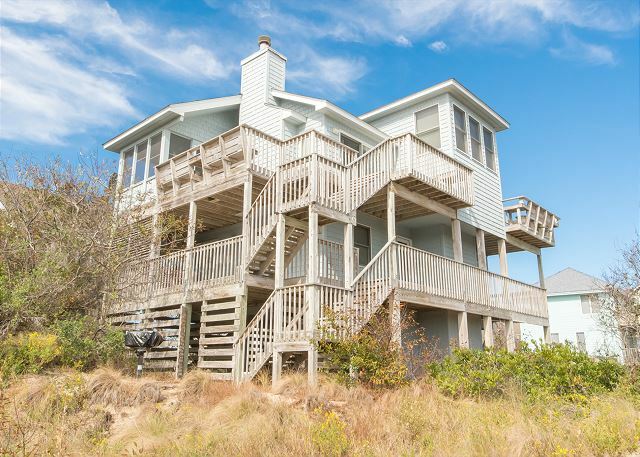 A Salty Piece of Land is a great vacation home. So glad you were able to enjoy all it has to offer. We hope you'll return. Thanks for commenting. thoroughly enjoyed our stay at Salty Piece of Land in the OBX. first time for all 5 of us visiting the OBX. 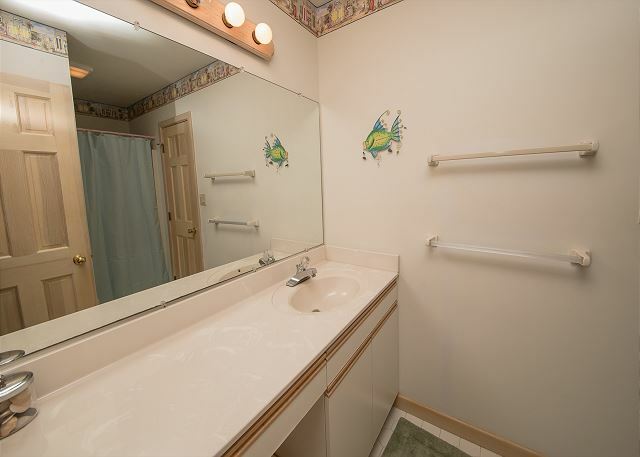 great house with lots of room and bathrooms, super views, great beach, nice area. too bad Matthew had to bring rain, but a great time by all of us! So glad you ladies enjoyed your stay despite Matthew. We hope you'll return for another memorable trip at A Salty Piece of Land. Thanks for posting. Had s nice time! Great location. Great view of ocean. No TV in masterbedroom!! Furniture needed updated. But the view and location made up for this short fall. Thank you for sharing. We're so happy you and your family had a great time at A Salty Piece of Land. We hope you'll return! We were unable to make it to our rental until the OBX opened to tourists on Tuesday afternoon. I thought about cancelling the trip altogether, after being stranded in various hotels for three nights. I am so glad that I didn't. 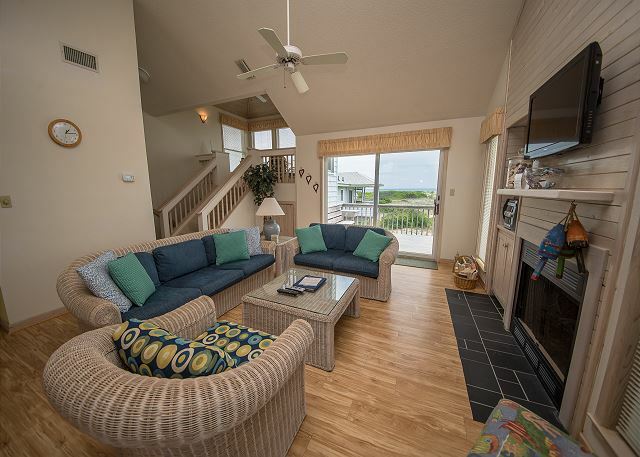 The rental, " A Salty Piece of Land" was immaculate, spacious, and provided an unforgettable vacation. The hot tub was an excellent ending to each day that we were able to spend on the beach. We were so pleased that we reserved an even larger property for next year. I would highly recommend this rental for a family memory filled vacation. We loved it !!! Hurricane Matthew certainly caused us many complications. I'm glad you were able to salvage what was left of your vacation and make the most of it. We are looking forward to welcoming you to the Outer Banks next year. Thanks for taking the time to post. We have stayed in this same house, through several owners and have never been disappointed. Clean, well furnished and if there was ever a problem it was taken care of promptly. And the location and view are excellent. A wonderful family vacation house. Thank you for your patronage! A Salty Piece of Land is a great house and we are so happy your family has enjoyed it for so long. We can't wait to see you next year. I was extremely pleased with this house. The biggest reason was the location. We were only 3 houses away from the beach access which gave us a 2-3 minute walk. I want to add this house included a little pool which was perfect for the children and a private hot tub. 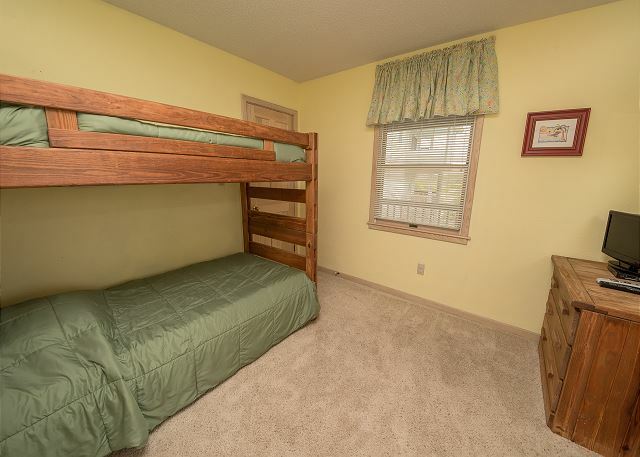 It was also moderately clean with moderately comfortable beds. I plan to re-book this house for summer of 2018. So glad you enjoyed your time at A Salty Piece of Land. It's in a great spot. We can't wait to have you return! Another wonderful vacation at the same house. Now, not only with grown children, but grandkids, as well. Fortunately, the weather was great, the water was warm and and the A/C kept us all cool. Looking forward to next year. We're happy to hear from our repeat guests, and it delights us that A Salty Piece of Land has become *your* vacation home! See you next year!! We had a great time. The house was in a location that was close to the beach. There is a shopping area across from Section entrance which was convenient. Grocery store within walking distance. Tours to see horses available there, too. The house was well maintained and again, great location. We're glad you enjoyed your stay, and all the activities available in the area! 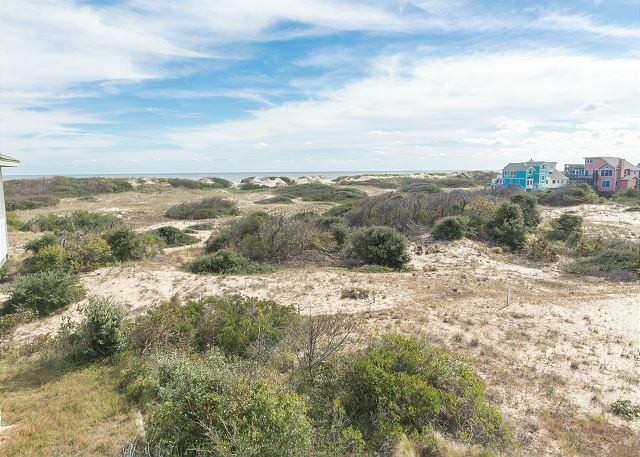 A Salty Piece of Land is in a great location with conveniences and unobstructed views of the ocean and local wildlife. We look forward to seeing you again next year! A very enjoyable, relaxing week at the beach. Thank you for your review. 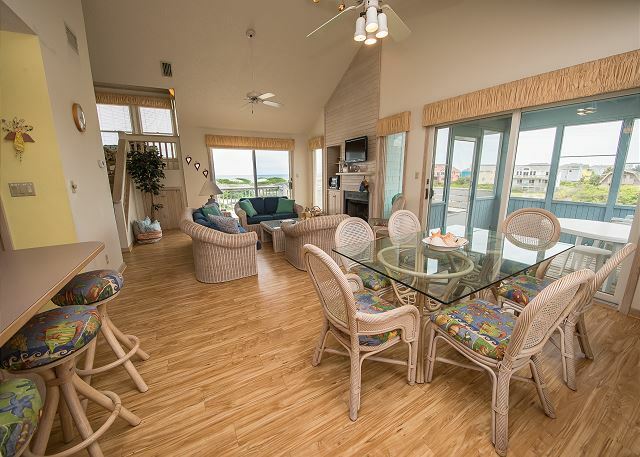 We're happy you enjoyed the week on the Outer Banks! 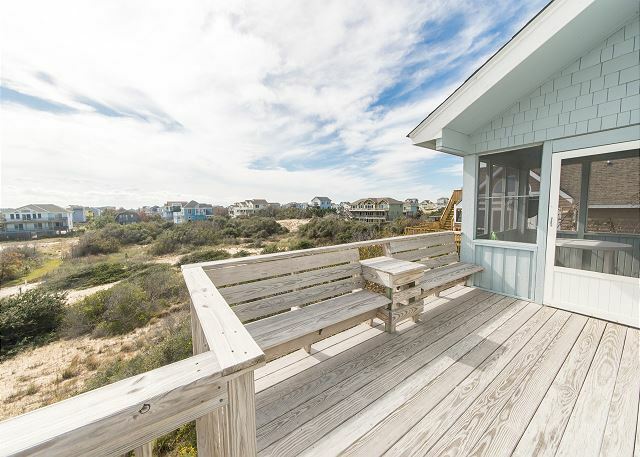 We do encourage all our guests to call their check-in office immediately if housekeeping and/or maintenance matters are unacceptable, so that Kitty Hawk Rentals has the opportunity to correct the situation. Loved our stay at a Salty Piece of Land. The view from the living room was absolutely stunning. Our ONLY complaint is that there was no beach equipment, at all! Travelling from NY it is difficult to pack an umbrella and chairs in addition to everything else. We left 2 chairs and 2 boogie boards. Hope they stay there! The views from A Salty Piece of Land are awesome! Not all property owners provide beach equipment to meet all guests' needs. We encourage guests to review listed outdoor amenities for the property, and if something desired is missing, consider visiting one of our equipment rental companies, such as Ocean Atlantic Rental to have the convenience of use without the hassle of additional packing! The views from A Salty Piece of Land are awesome! Not all property owners provide beach equipment to meet all guests' needs. We encourage guests to review listed outdoor amenities for the property, and if something desired is missing, consider visiting one of our equipment rental companies, such as Ocean Atlantic Rentals to have the convenience of use without the hassle of additional packing! Pretty good. Traffic was bad. Maybe have check in days fri, sat,sun and mon since more hotels and houses are being built. Driveway was tight and could only back into. Good for 1 maybe 2 cars. Traffic can certainly be challenging on turnover days at the Outer Banks. 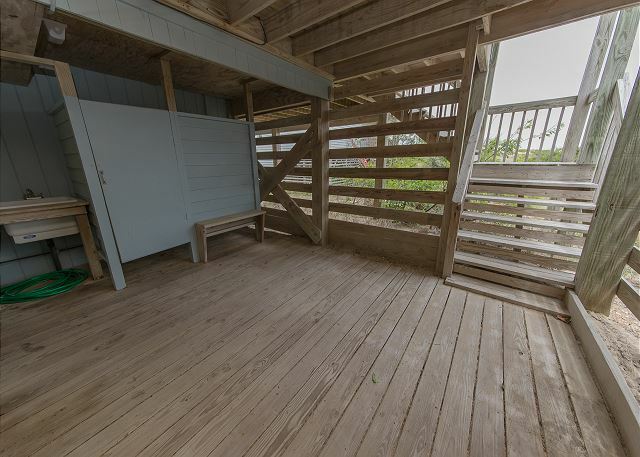 The rewards of unobstructed views and easy access to the beach from A Salty Piece of Land are great payoffs though! We're always looking for ways to reduce the impact, and appreciate your suggestions. Thank you for making A Salty Piece of Land *your* vacation home; we enjoy having you back each time! 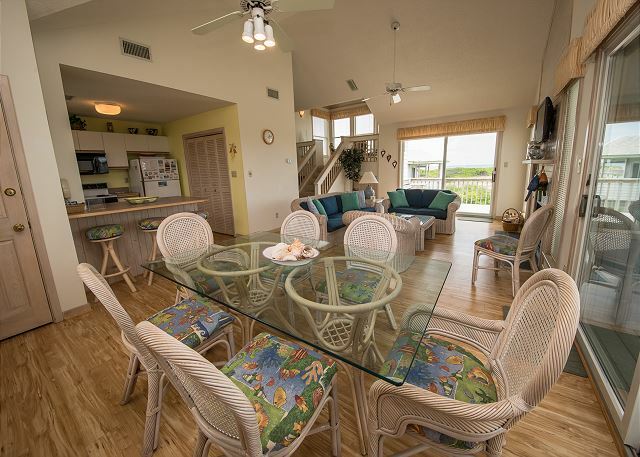 Kitty Hawk Rentals makes every reasonable effort to have equipment problems corrected as soon as possible, and try hard to minimize the impact to your vacation. Nice house, very clean. My only suggestion is more living room seating, not enough comfortable seats for 8 people to watch TV, also the third floor Master Ste did not have a TV, like the 2nd floor Mstr suite, which would have been nice. We're glad you enjoyed your stay at A Salty Piece of Land! Thank you for your suggestions; they are certainly being reviewed. 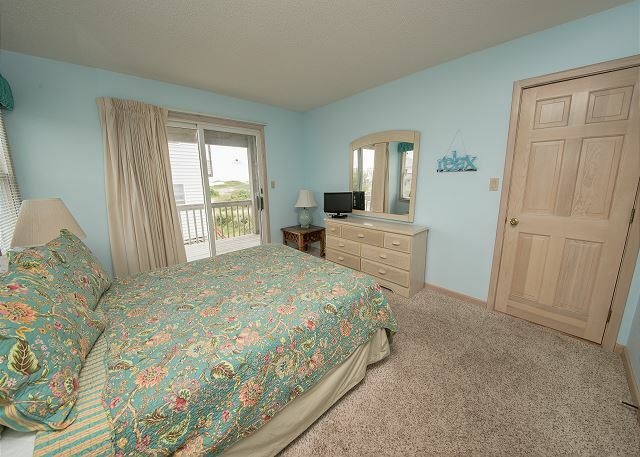 Kitty Hawk Rentals hopes to welcome you back to the Outer Banks, soon! Short, sweet, and to the point! Thanks for posting. We hope you'll return for another blissful stay at A Salty Piece of Land. My wife and I had a wonderful time in the OBX at A Salty Piece of Land. 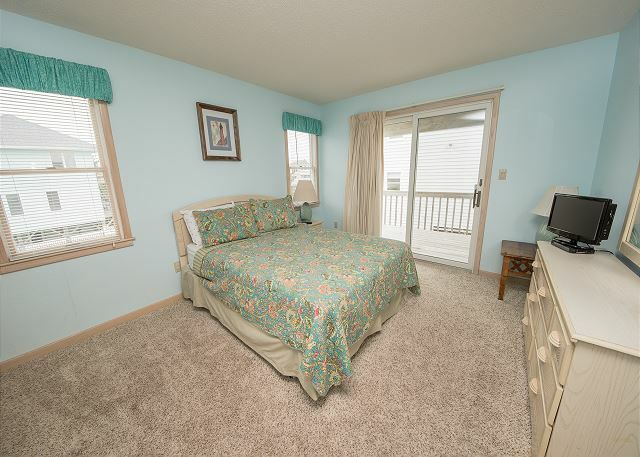 Everything was as described in the listing and we would be happy to stay there again. I would recommend a small fence to block some of the pool filter noise at the pool as it runs constantly. The pool is smaller than I anticipated, but was perfect for the two of us. The cleaning crew definitely needs to spend a little more care in cleaning as I didn't appreciate finding prior guests hairs in multiple spots in the master bath. I would like to apologize for the oversights in cleaning you experienced. In the future, please notify our office directly so we may correct those issues. 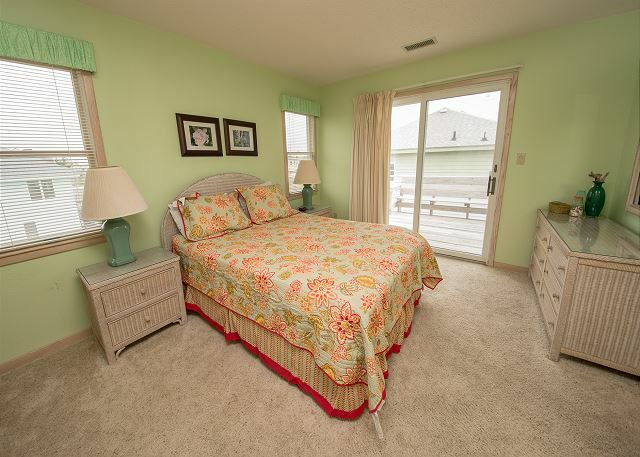 We want to make sure you are satisfied with your vacation home! I am glad to hear you and your wife enjoyed the home and we would love to have you return. We had a great vacation in the OBX! 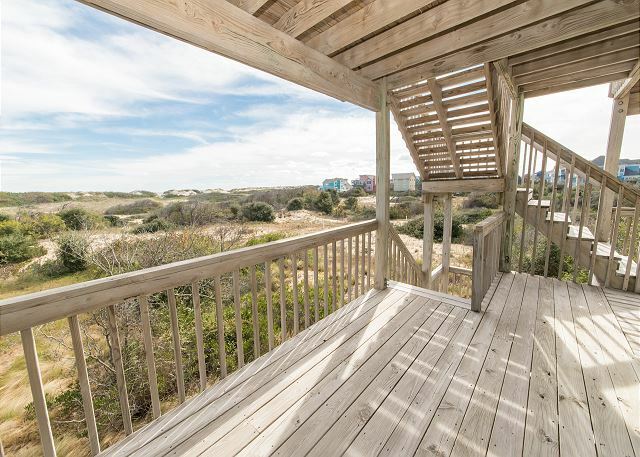 The house was in great shape and thanks to the nature preserve behind it there was a beautiful view of the ocean despite not being right at the dune. The beach was just a few minute walk and was never crowded. All in all, our family had a great time! Happy to hear you had a great vacation! A Salty Piece of Land is in a great location. We hope you'll be back. Relaxing week. Easy walk to the beach. Quiet area. Beautiful. Relaxing. Quiet. Sounds like a great vacation to me! Thanks for taking the time to post.